Horticulture is an exciting, fast-moving sector and no-one knows this better than Writtle University College (WUC). On Saturday 23rd March the campus was pleased to host the Young Horticulturist of the Year Competition’s Regional Final. Participants gathered at WUC’s 220-hectare Essex estate to showcase their skills. The competition was open to all horticulturists in the East of England under the age of thirty. She was joined by former Rosie Innes-Taylor, a former Writtle University College student. Rosie used her WUC qualifications to launch a career as a professional horticulturist and is now a senior gardener at Wrest Park for English Heritage. The level of talent was high and competition was fierce. Sandra Nicholson, a senior lecturer at WUC, said: “It was one of the tightest finals we have seen in recent years, with four potential winners”. Certificates and prizes, sponsored by Cherry Lane Garden Centres, were presented by Gerald Bonner, the President of the Chartered Institute of Horticulture. After the competition, the contestants, supporters and organisers toured WUC’s impressive grounds with senior lecturer, Sandra Nicholson. 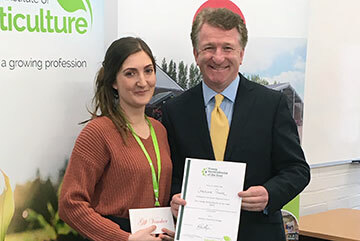 The Writtle University College has offered land-based learning since 1893 and was home to the first recorded Young Horticulturist of the Year National Final in 1990.